Taking pictures when you’re on vacation is a pretty normal thing to do. You want to capture those memories to show all your friends and family back home. But you also don’t want to spend all your time looking at the world through a lens. 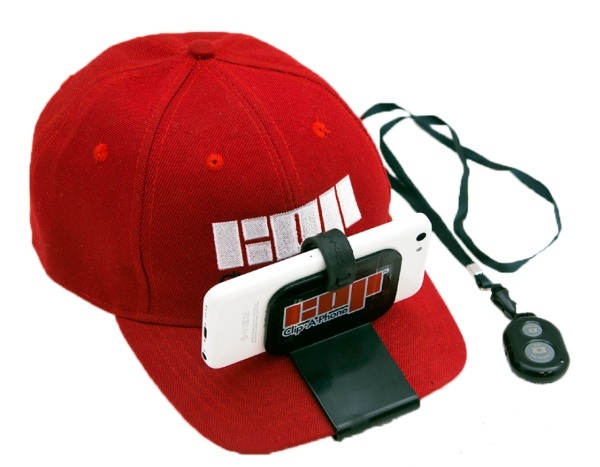 If you want the pictures without holding the phone yourself, check out Clip-A-Phone, the clip that lets you wear your phone on your hat. You need a baseball cap for this device to work. It can be any sort of sport really. Or non-sport, just so long as it’s the baseball cap style. You download the free app to your phone. Then you put the phone in the clip, camera facing outward, and then put the clip on your hat. You use the included Bluetooth remote to take pictures. So anytime you see something neat, you’re phone is ready to take a few shots. Of course, you’ll have to dismantle the whole thing to take a phone call. Or find directions. And I bet you will pretty quickly forget it’s up there. Still, if you don’t want to hold your phone for your photos, the Clip-A-Phone is $19.99.